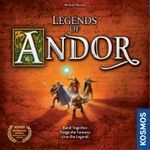 Sweetener: Legends of Andor: The Star Shield (2013). Nejucat. Pastrat in cutia proprie extensiei.